Article - What Made Ty Change? What Made Ty Power CHANGE! CHANGE is a relief, be it for better or worse, it has been said. Tyrone Power has changed considerably for the better in the past year. Cold, brutal fact, not whim nor temperament, dictated the transformation. 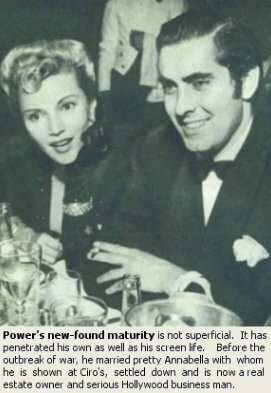 Ty, son of the illustrious Tyrone Power, Srs., discovered that the Power-line generated by such successes as Girls' Dormitory and Lloyds of London had suddenly short-circuited. The reason -- the public liked him too much. 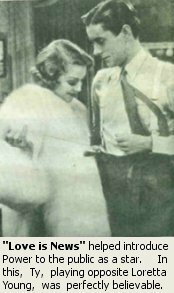 Catapulted to hasty stardom, Ty continued to give five-star performances until his studio, in response to public demand, cast him in mature roles. These were unsuited to a powerful box-office personality bundled up in a slight, youthful, 150-pound frame. 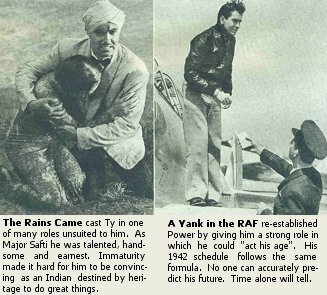 The Rains Came was an excellent film; yet Power lost some of the force of the role of Major Safti, because of his immaturity. Lavish efforts to have him emulate former actors in resurrected pictures added to the crisis. As one columnist succinctly observed: "Power might be believable putting a 3-A Erector set together, but certainly not the Suez Canal." Two human dynamos -- Darryl Zanuck and Ty himself -- with the aid of Nature -- are largely responsible for correcting this unfortunate condition. Zanuck cast Ty in roles suited to a youthful actor. The first was A Yank in the RAF . Ty, by strenuous exercise and proper diet, acquired twenty needed pounds. Father Time's subtle changes did their share, as did Patia Power, Ty's mother and best instructor. Today audiences can accept Tyrone Power as the adventurous Benjamin Blake in Son of Fury. Added poundage and maturity make such exploits as deserting a ship, swimming to shore, knocking George Sanders over a banister and diving for pearls plausible. This change is not only a relief; it is welcome when it gives us the Ty Power of 1942.